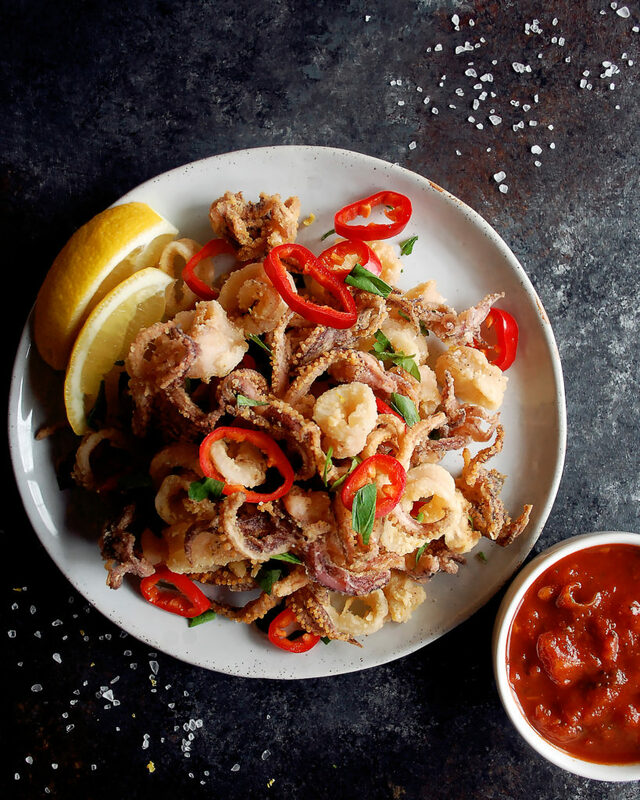 Fried calamari is such a classic dish, and I find that most people only think about it when out at a traditional Italian restaurant. But once you see how easy it is to make at home, you’ll probably start to cook it a lot more often. I think most those who are not too adventurous in the kitchen might be intimidated by the squid, and therefore might shy away from making this dish at first. However, cleaned squid isn’t hard to find (I get mine from my local Whole Foods). It comes cleaned and ready to go, but I do like to give it one more quick rinse. Once dry, the only prep necessary is to slice the bodies into rings and trim up the tentacles. A quick toss in some flour and it’s ready to fry. As is the case with any fried food, proper seasoning when it’s fresh out of the oil is crucial. 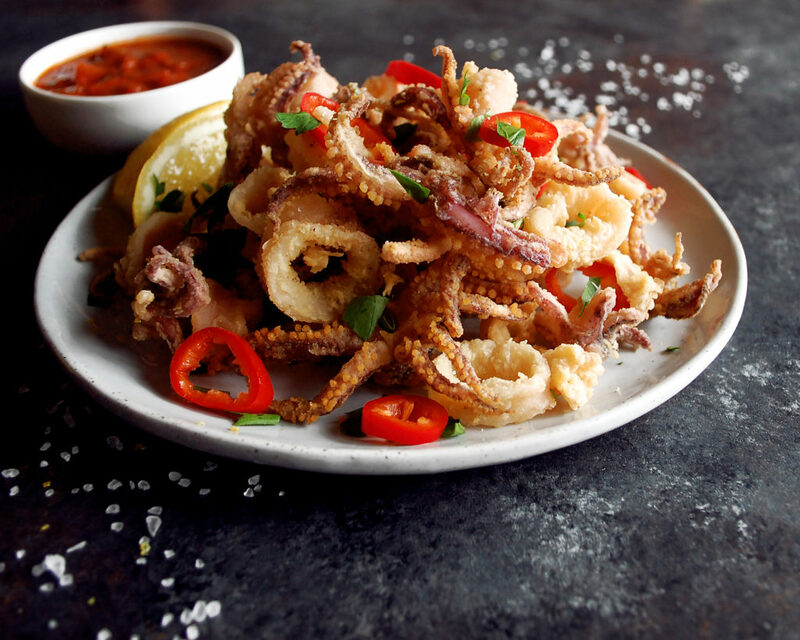 The only way for the salt to truly flavor the calamari is to hit it with a sprinkle when it’s still hot. That way, the salt will absorb instead of sliding right off. 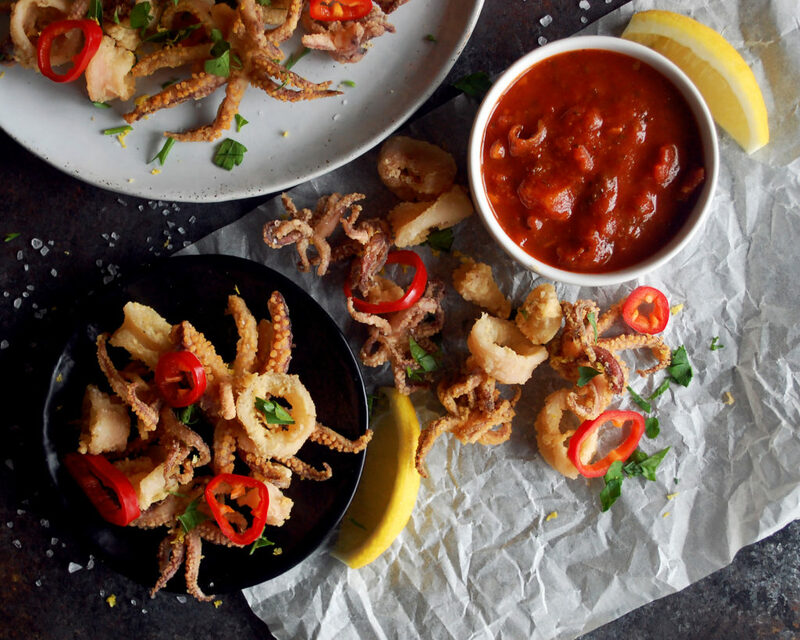 I serve my calamari with a simple, classic marinara sauce. Nothing fancy about it. I use both lemon juice and the zest to brighten it up and cut the fat. Fried foods without any acid can be dull and heavy tasting. And to add a bit more acid, along with a nice pop of color and heat, I quickly pickle some red Fresno chili peppers to toss on top. Enjoy! Add enough vegetable oil to a small pot to fill it about 3-4” up. Heat the oil over medium heat until it reaches 350F. Meanwhile, slice the bodies of the squid into ½” rings. Trim the tentacles so they are manageable. Season the squid well with salt and pepper. Pour the flour into a large mixing bowl. Working in batches, toss the squid in the flour. 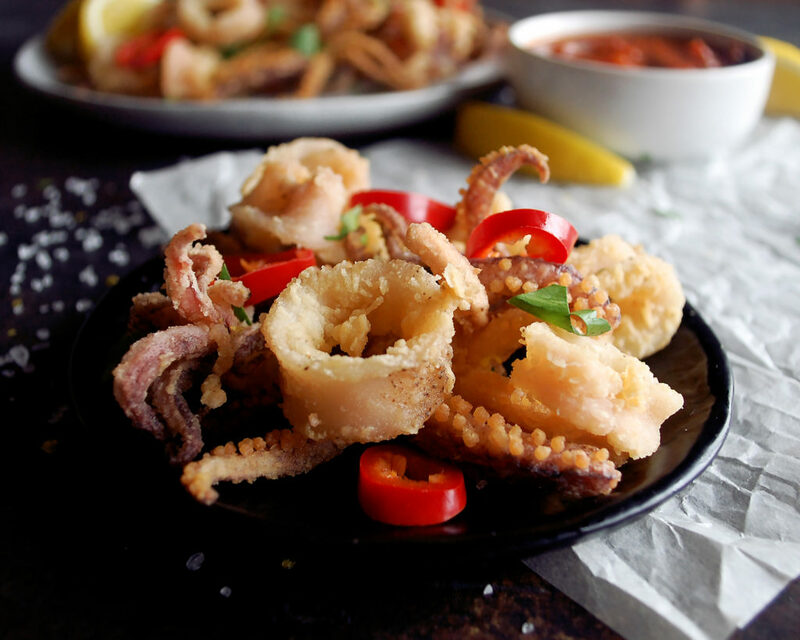 Shake off any excess flour before carefully placing each piece of squid into the hot oil. Do not overcrowd the pot. Each piece of squid should have a good amount of space to fry. Let the squid fry until it is crispy and cooked through, about 1 minute. Use a slotted spoon to transfer the calamari to a paper-towel lined sheet tray. Season the calamari with salt immediately while each batch is still hot. Repeat this process until all the calamari is fried. 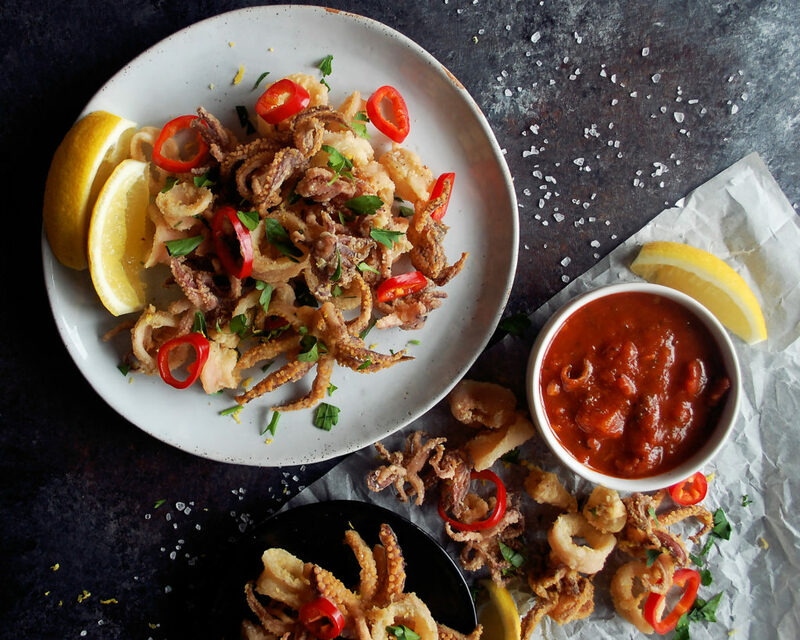 Serve the fried calamari with a squeeze of lemon, a pinch of lemon zest, the pickled red Fresno peppers on top, and a side of warm marinara sauce for dipping. Do not cover the calamari while the rest of it fries. Covering it will essentially steam it, making the crispy exterior go to mush. 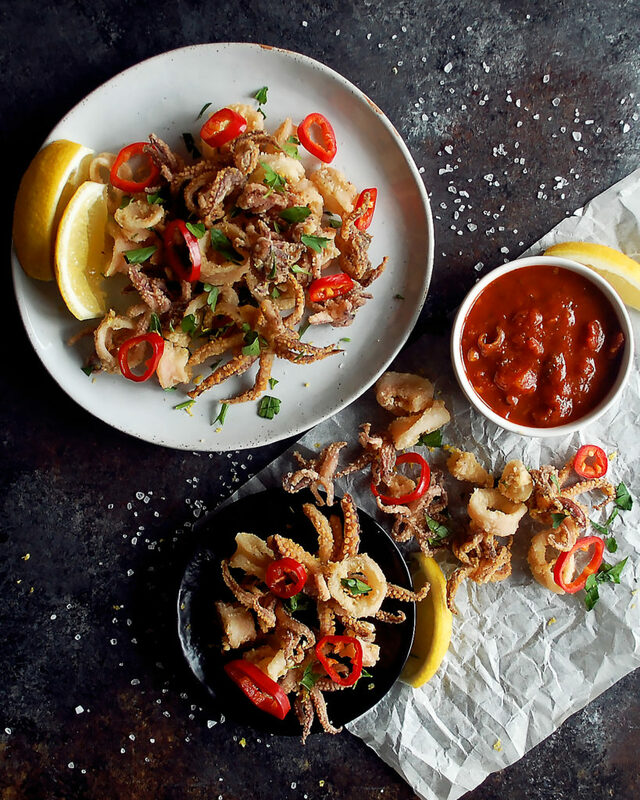 Keep the calamari uncovered, and if you have to warm it before serving, remove the paper towels from the sheet tray and pop it in the oven for a minute or two, just enough time to heat through.